Little hands will find lots to explore in this bright and vibrant board book full of textured fingertrails to follow and touchy-feely patches. Bright, eye-catching illustrations will catch the attention of even tiny babies. A delight to share and perfect to give as a gift. 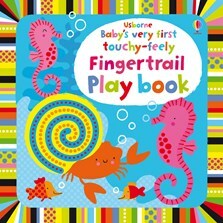 Babies will be mesmerised by the bright pictures and tactile trails as in this vibrant board book. Each page is specially designed to be visually stimulating with bright, eye-catching illustrations and lots to look at.